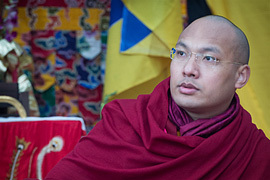 HIS HOLINESS, the 17th Gyalwa Karmapa, Orgyen Trinley Dorje, is the spiritual leader of the Karma Kagyu lineage, one of the major traditions of Tibetan Buddhism. Born in Eastern Tibet on June 26th, 1985, he was recognized at the age of seven through a prediction letter, known as the Last Testament. Written by his previous incarnation, it indicated the place and year of his future birth along with the names of his parents and the special signs that would appear. 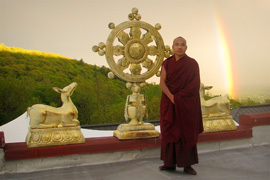 The Karmapa’s early years were divided between the pastoral life of his large nomadic family and Buddhist training at the nearby Karlek Monastery. Then, in the spring of 1992, contrary to his usual behavior, the Karmapa insisted that his parents move their camp early and knowing their son was special, they complied. This allowed the Karmapa to be in the exact place predicted by the Last Testament when the search party came to find him. 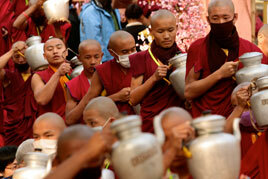 In June of 1992, he returned to Central Tibet and Tolung Tsurphu Monastery, the main seat of the previous Karmapas. In that same month, the Dalai Lama confirmed the recognition of the Karmapa stating that he had experienced "a kind of dream of the area where the present incarnation was born." He described precisely the area of the Karmapa’s birth as if he were actually there, saying that there were stones and meadows but no trees, animals or people and that two rivers flowed down on the right and left. 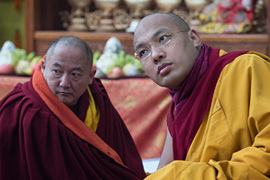 "Then someone, some source without form, was telling me, ‘This is the place where the Karmapa is born.’" This close connection between the two spiritual leaders would to continue up to the present day. In 1992, he suggested to his parents that they move their camp early. 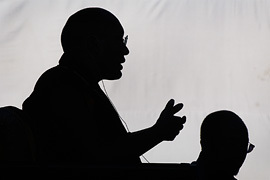 This decision to move placed them in the spot where the predictive letter written by the Sixteenth Karmapa had said the Seventeenth Karmapa would be found. 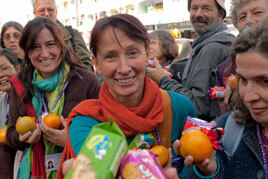 Apo Gaga told his parents his monks were coming for him, and packed his things. The Karmapas were the first lineage of tulkus (reincarnate lamas) in Tibet and the 17th Karmapa was the first one to be officially recognized by both the Dalai Lama and the Chinese government. 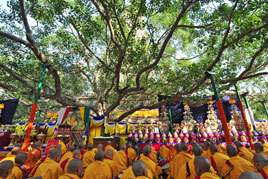 The enthronement of a tulku marks the public recognition of this special status and begins the official activity of bringing benefit to all living beings. This ceremony was held in September 1992 with 20,000 people coming to celebrate from all over Tibet and the world outside. 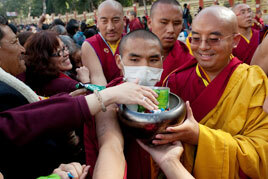 The next day, the young Karmapa gave his first empowerment, which was of Chenrezig, the embodiment of compassion. 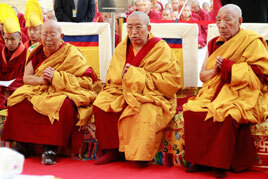 Both the Dalai Lama and the Karmapa are considered emanations of this most popular deity in Tibet. While staying at Tsurphu, the Karmapa completed basic studies of Buddhist texts in addition to becoming very adept at Tibetan language and literature. Even at a young age, his poetry was profound and lyrical. During the other parts of his day, the Karmapa was overseeing the rebuilding of Tsurphu, making official visits, and recognizing other reincarnate lamas, a well-known ability of the Karmapas. 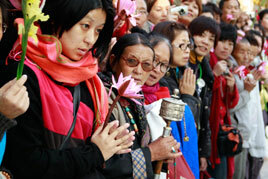 Thousands made the pilgrimage to Tsurphu to receive his blessing and he presided over the numerous rituals and meditation retreats that shape the calendar of Tibetan Buddhism. 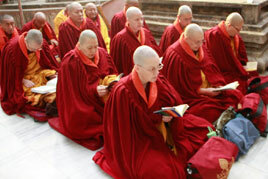 In Tibetan Buddhism, lineage is extremely important, since the tradition is sustained through teachers passing along their knowledge and wisdom to the next generation of disciples. 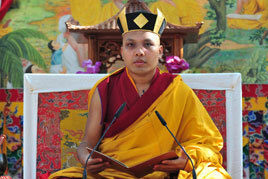 In late 1999, in order to meet his teachers in India, the Karmapa left Tibet. 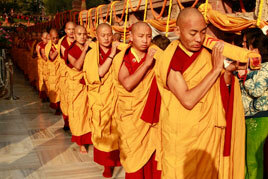 Once in India, the Karmapa traveled directly to see the Dalai Lama who received him with great warmth. 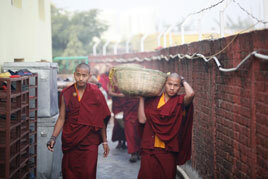 The image of the Karmapa and the story of the escape was on the cover of newspapers and magazines the world over. 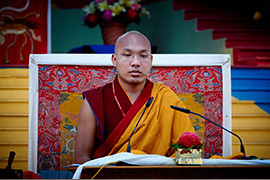 The Indian government kindly granted the Karmapa refugee status, and he continues to stay at his temporary residence in Gyuto Monastery, not far from the Dalai Lama’s home in Dharamsala. 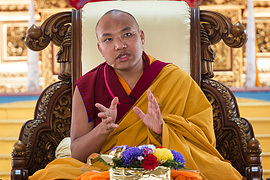 The Karmapa’s wish to receive further instruction and meet with his former teachers is being fulfilled as he studies Buddhist philosophy and meditation while receiving the transmissions and empowerments from the masters of his lineage. 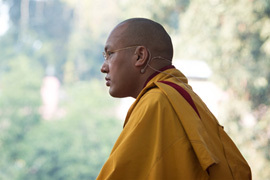 Though young in years when he first arrived in India, the Karmapa has showed a wisdom and maturity well beyond his age. 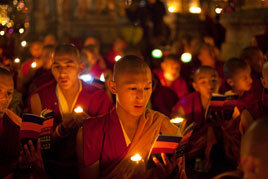 With a special interest in books, he has worked to preserve ancient texts; he has also encouraged the practice of the meditative rituals, which were brought from India to Tibet centuries ago and which form the core practices at all his monasteries inside and outside Tibet. With the passing years, the Karmapa’s artistic abilities have flourished. In addition to writing poetry, he has become a skilled artist in drawing, painting, and calligraphy. 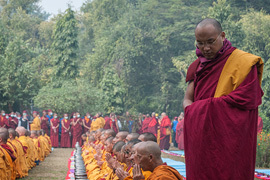 Recently, he composed new meditative rituals for the Kagyu Prayer Festival, a yearly gathering of monks and lay people in Bodh Gaya, India, the place of the Buddha’s enlightenment. 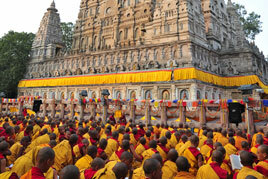 The Karmapa has presided over these major ceremonies since 2001. 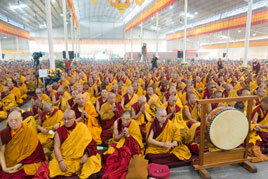 There are thousands who come to the festival and also to visit the Karmapa at Gyuto Monastery where he gives public teachings. 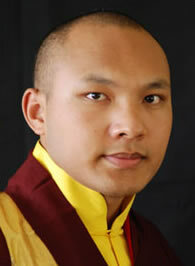 Now at last in 2008, His Holiness the Karmapa is able to travel abroad. During this initial visit, he will spend eighteen days of May and June traveling in the United States. 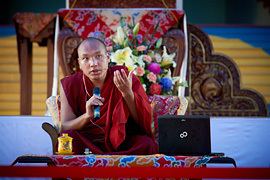 We are overjoyed to receive him at Karma Triyana Dharmachakra, where he is returning for the first time as the 17th Karmapa to meet his disciples, bless the monastery, and give an empowerment and teachings. We look forward to numerous such occasions in the future. 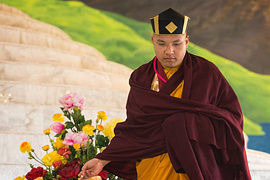 The vast scope of activities of His Holiness the Seventeenth Gyalwa Karmapa, including spiritual travels to offer teachings, consecration ceremonies, and blessings, his teaching schedules, as well as official visits and participation in a variety of conferences, can be viewed in the Karmapa News Archives.